Wood based, or 'woodbase' cat litter is a popular choice for cats and their owners alike. It's generally very absorbent, biodegradable and often fragranced for a pleasant pong instead of an unpleasant one. Woodbase cat litter is simply lots and lots of small wooden pellets designed to absorb your cats wee. Generally, most wood based litter will mask the smell of your feline friend's tinkle. The pellets that make up woodbased cat litter normally come from the waster from wood manufacturing processes. For this reason they are natural, environmentally friendly and are very unlikely to irritate your cat when they are spending a penny! The last thing you or your cat want is a litter tray with a pool of wee in it. Wood based cat litter is super absorbent helping both of you to keep the litter tray dry and clean. 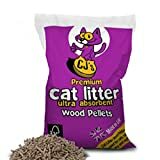 Saving money on wood pellet cat litter is easy. It's available in all pet shops and most supermarkets too. There's always a deal to be had. Buying your cat litter in bulk on Amazon is a breeze. Currently, 30 Litre Bags of Pettex Pampuss Woodbase Cat Litter on Amazon are only £10.99! For an incredible extra 5% off, Amazon offer a 'Subscribe and Save' on cat litter - perfect if you need one bag every month and you'd like it delivered to your door every time. As wood based litter is absorbent it's much easier to clean than may other types of cat litter. On top of that, good woodbased cat litter won't product much sawdust which gets very messy. Woodbased cat litter is a cost-effective, absorbent, odour hiding and evinronmentally friendly choice for cat litter trays around the world. It's what we use here at Loving Your Pet HQ. Equipment you will need for a new kitten!